The Sleep Innovations 10-Inch SureTemp Memory Foam Mattress is one of the bestselling products of Sleep Innovations, and this shouldn’t come as a surprise given its feature set. Although the company has long been known for manufacturing quality mattresses, they have really raised the level with this one. Several new features are worth noting, such as the two-layer premium memory mattress fitted with SureTemp memory foam. The mattress, which comes with a poly cotton blend cover, was designed for comfort and durability, and the layers are constructed with a 7 inch base layer and 3 inch SureTemp three pound memory foam. Together, these layers provide support without compromising comfort which are essential for a good night’s sleep. The mattress also comes with two free memory foam micro cushion pillows that keep your neck and head aligned properly. Together with the mattress, they will allow your body to relax. 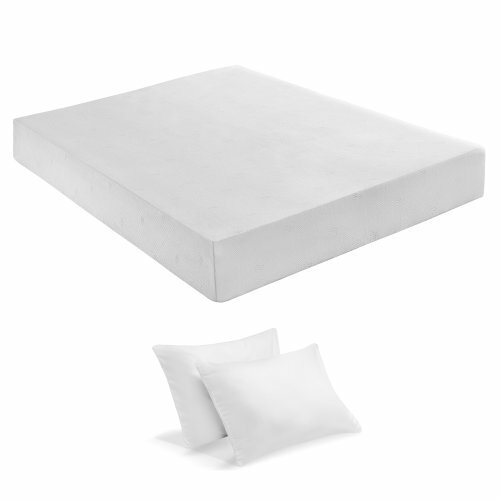 The pillows moreover, offer memory foam support while being as comfortable as a down pillow. Each pillow is also constructed from memory foam and gel memory foam, which provides heat dissipation so you can sleep in comfort. The foam is dust mite and allergen resistant so those won’t be issues, and the foam was put together in such a way that it isn’t too soft you sink in, but it isn’t so hard it hurts your back. The mattress was also constructed to provide relief for pressure points and minimize turning and tossing so you can sleep continuously. The Sleep Innovations 10-Inch SureTemp Memory Foam Mattress has a lot of benefits, but above all else it’s made for people who like to sleep on their sides. Sleeping on the side presents all sorts of comfort issue problems for traditional mattresses, but this one was built specifically for that purpose, so you’ll notice the difference the moment you lie down. But those aren’t the only benefits, as the mattress also conforms to your body’s shape so the spinal alignment is correct. The importance of this feature cannot be overstated, because the inability of other mattresses to conform to your body’s shape is the reason why you wake up with back pains. The mattress may not look that different from others, but you’ll notice that it just feels better when you lie down on it. The mattress is soft and so are the pillows, but you’re not going to sink, and in addition, the foam does a good job bouncing back and conforming to your body’s position in case you move. Also when you lie on the side the foam lets your hips, elbows and shoulders move down so your body is properly aligned. Furthermore, it doesn’t trap body heat so you don’t feel hot even after lying down for extended periods. The majority of reviews have been very positive, with many expressing satisfaction with the foam. Chris of Ohio says the foam has a really good confortable feel to it and the pillows were very comfortable too. Andrew of Milwaukee also wrote a positive review of the mattress, saying that he’s had back problems for years and often woke up feeling sore. However, since buying the mattress, he says he’s been sleeping much better and he no longer wakes with an aching back. Many other reviews have been posted online and they usually echo the sentiments of the customers above. Virtually all of them agree that the mattress is very comfortable and just right for sleeping on the side and relieving back pain. Taking everything into consideration, the Sleep Innovations Mattress is as good as they come today. As customer reviews point out, this mattress is very suitable for those who like to sleep on their side, and it’s also very comfortable, not too firm but not too soft either. The fact that it’s also dust mite and allergen resistant goes to show how much thought was put into it, so if you’re after a reliable mattress, then this one will be more than sufficient.